Hungry Happenings always has something colorful and creative up her sleeve. 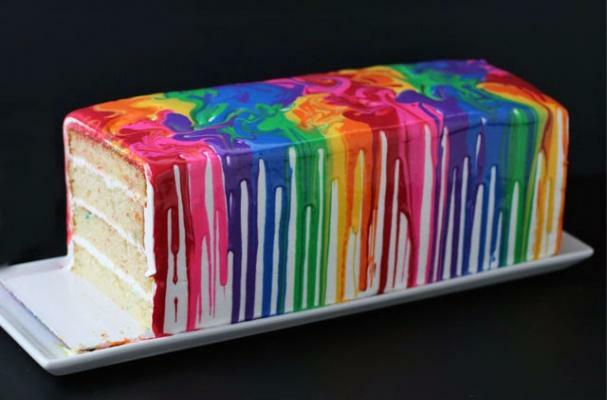 This rainbow paint palette cake is a simple decorated cake that people will drool over. Inspired by melted crayon art, a speckled rainbow loaf cake is covered in white frosting before the "paint" is added. Instead of using candy melts, each color is made by combining gel food coloring with white chocolate ganache. Ganache is the French term for a chocolate glaze or icing made from combining hot cream with chopped chocolate. The mixture is blended until smooth and sometimes butter is added at this point. If you love a particular flavor, you can add a splash of extract or liqueur. The six different colored ganaches are simply spooned over the top of the cake. This particular cake is rainbow colored but you can change the color scheme to coordinate with your party. You don't need to be an expert cake decorator to make this dessert, just some patience. For recipe instructions, click here.